This walk starts out of the back of Port Vendres up the “Val de Pintes” and then veers to the right. Starting as usual from the Place de l’Obelisque proceed to rue de Pams, take the first ramp of steps on the right up to the second street, turn left on to Rue Louis Blanc to the Place Belieu and then follow the street Rue Pasteur down the hill. Up the other side of the hill at the cross roads, take a left into Rue Camille Pelletan which very soon opens on to the square. Take the first road on the right, rue Parquebots, and after 100 metres, follow this steep cobbled track which leads to the left and up to a sharp bend in the road. Turn left out of the cobbled path.The narrow road bends and drops down past a sleepy hotel on the right and the railway station that serves commuters with speedy travel to Perpignan and beyond. Continue straight ahead into the Rue Val de Pintes. Follow this road past the recreation park on the left and then where a fork in the road appears, proceed left under the railway then right and as the land begins to rise a choice of track once more appears – take the left one. On the left at this point a barrage across the ditch at certain times of the year holds a full reservoir of water but in summer it is a verdant ecological site teaming with life dependant on its boggy terrain. For the next ¾ km, the track steadily rises and the full impact of nature’s realm becomes apparent as every conceivable moth and butterfly species from blue to swallow tail flit freely in abundance. Not only Lepidoptera but grass hoppers, green & yellow mantis, damsel and dragonflies of all colours dart from side to side of this neglected and tranquil track whose only traffic apart from this insect world seems to be occasional vigneron wagons bearing tons of grapes during the vendange. The verges are rich with wild flowers and herbs of all varieties whilst green finches and warblers sing in the pine trees to complement this haven of unspoilt Cote Vermeille hinterland. As the track rises, it parallels the main N114 running almost inaudibly on a raised bank some meters above. A hairpin bend in our track tears off to the left and rapidly climbs to immediately beneath the main road, passing through a corrugated tunnel to the other side where a sharp right turn is taken and once again walk parallel to the main road, but this time the road gradually rises higher than the speeding traffic. As this track rises, the climb becomes quite steep and the road quality rather dubious, but follow it until it passes across the mouth of the tunnel of Raixat and where the tarmac is completely replaced by chippings, holes ruts and stones, take the left track and climb steadily winding steeply with a cork oak wood on the left. The map shows this to be a “Road not regularly maintained” which is no over-statement and is certainly not the route one should take the Rolls-Royce for a Sunday outing! But have courage; it does get better for a short while before temporarily deteriorating again! As the steep incline levels at the top of the Coll d’en Raixat, walk a few metres to the right to the road junction and fabulous views can be seen over Collioure and the Plain of Roussillon to the North and back down the Val de Pintes. Close in front to the North East Fort *Dugommier an ancient Fort, currently under restoration rises high with Fort St Elme beyond whilst the two tours of Massane and Madeloc, crown the ridges high above to the North West and South West respectfully. *General Jacques Francois Dugommier (1738 –1794) was head of the French army of the Eastern Pyrenees and had the task of recapturing a territory in this vicinity taken by a Spanish army which he succeeded in doing in 1794 at the battle of the Tech and Alberes. He is buried in Perpignan.(Wikipedia). Turn back to where the already walked track joins a rocky track and then walk straight along this right fork “Randonnee No. 6” that follows the contours around the mountain in a slight but easy rise, passing a memorial to a brave young fireman who lost his life at this spot whilst fighting mountain fires in 1976. Soon after this shrine, the track turns to the right and at about 250m from sea level suddenly Tour de Madeloc looms high on the skyline as a menacing reminder of historic need for beacons and lookouts – it was one of three built in the medieval times to warn of invasion; the other two were St Elme and one on the site of the current military installation of Fort Miradou in Collioure. Beneath the tour sits one of the many garrison posts, whilst further round to the south the vast sienna coloured Batterie de la Galline stands out on a ridge. These fortifications were built predominantly by the genius military engineer Vauban during stressful relationships between the French and Spanish which were further complicated by nationalistic uprisings by Catalans. Very shortly the track drops down to the D86a where a right turn for about 500m leads to another complicated junction at the Col de Mollo being at about 230m above sea level. The turning to the left winds around the hill side and is signed to Tour de Madeloc – ignore this road but take the next round to the right which directs to La Consolation 6km. It is possible to take a shorter alternative route by taking the next round to the right which drops down the valley and in 3/4km taking the left fork brings the alternative route to a junction which signs La Consolation 500m, but it is a very steep 500m climb to the Ermitage. The current main walk climbs steadily to over 300m on a good metalled D86, where maps show a randonnée to the right in about 1 km. This has now gone and unfortunately the rest of the walk to the Consolation is on road. This extended walk on road is disappointing but traffic is not heavy along these mountain lanes. At one point another military building comes into momentary view high above; this is the Batterie de Taillefer, where a randonnée takes off to the left up the hill to Tour de Madeloc. Follow the main road as it slopes down all the way contorting into 6 hairpin bends. Maps show another path off to the right on the fourth bend but reality on site tells a different story. There is vestige of a path but it now seems unsafe and unused. Proceed down the hairpin bends, taking in one of the best views of Roussillon from the Table d’Orientation (the saving grace of the persistence of road walking) and then a few hairpins later as the road meets a cross roads follow the first sharp right turn down a narrow road which only leads to L’ Ermitage Notre Dame de la Consolation. This isolated spot is a quiet a haven of perfection, where drinks and simple food can be bought, picnics taken with a modest levy which goes to the upkeep. The hermitage is the property of the commune of Collioure, which was given to the town during the Revolution when the estates of the Church in France were commandeered by Napoleon’ people in 1790 and given to the state and is still today being managed by a Charitable Trust. It is reputed to date from the 15th century and has undergone a number of restoration programmes. Despite being a bit tired it has a simplistic magnificence of nature set in amongst mature trees with a chapel at its centre where icons of sailors are displayed. There are bedrooms for hire and weddings, jazz concerts, celebration of the end of the vendange and national festivals take place in the grounds. 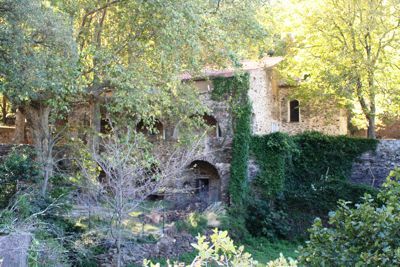 It is worth climbing a few more paces up the back of the Hermitage where a simple rocky path climbs up the course of the simple stream to a balcony where the spring rises in the centre of an ancient balustrade, set into the dense tree lined hillside. Return back to the Ermitage for the descent to Collioure. 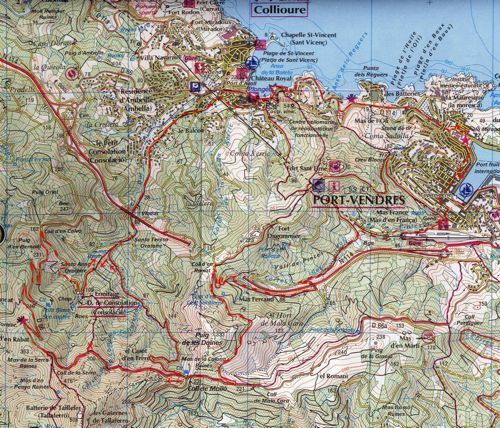 The track down to Collioure is initiated by taking the steep track that leaves the picnic area under the plane trees between the two gate pillars across the small ravine. Turn left along a rocky path which very soon turns into another ‘Road not regularly maintained’ which in its steep descent passes shrines to Sainte Anne, Sainte Teresa and finally St. Jacques. We once drove a small car down this tiny track with some anxiety! Continue straight down the metalled single track without veering left or right and pass under the high viaduct carrying the RN114 and follow the dried stream valley of the River Douay. Very soon the higher periphery of Collioure is touched with side residential roads taking off on either side. Keep straight until the road passes under the railway line and then take the immediate right turn and in 100m take the right fork which opens into the colourful street of rue du Soleil. It is easy to appreciate the rationale behind the name. As the rue du Soleil descends, it turns to the left and then immediately opens on to the front of Collioure’s plage de Port d’Avall. Collioure is a port that must be enjoyed at every opportunity and it is not difficult to appreciate why Matisse, Dufy, Derain and many others found it irresistible to paint. For the return journey, turn to the right and we always prefer to cross the road to the path by the sea front car park, cross the little bridge and then take the more attractive corniche path around the beach along the promenade past the granite seating ledge where sun worshippers cook in the sun’s heat until it disappears between the craggy mountain peaks late each day (even in winter). Continue around the rocky headland along the edge of the sea where waves constantly break until the steps up just before the Hotel Les Trois Mas are reached where the road is regained. It is possible to start out from the corner of where the Rue du Soleil meets the sea front and take the road the whole way – not as interesting but wise in times of high seas! The road in summer can be busy but the views from this winding safe footpath are spectacular and never tire. The journey back to Port Vendres is straight along the main road past the ubiquitous Lidl, under the bridge and first left back down to the old town and La Place de l’Obelisque.